The final episode of K-ON! felt more like a DVD extra episode, since it was just a day in the life of the girls episode and really didn’t amount to anything. Yui wants to make nabe for the girls, but none of them can make it since they have prior engagements. 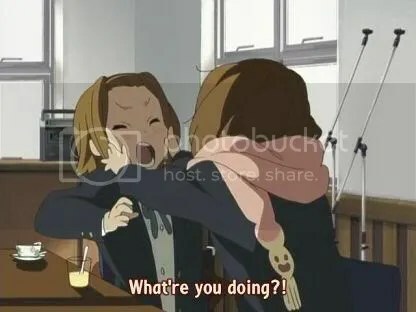 Mio wants to go write new songs, Ritsu has to bring her brother to the movies, Mugi is trying her hand at an actual job, and Azusa is babysitting her classmate’s pet kitten. 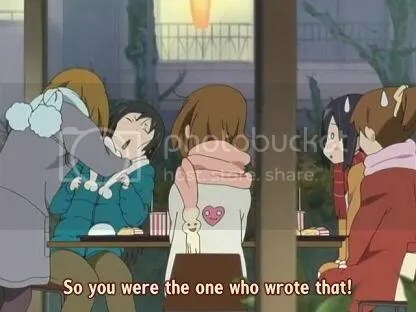 The only actual story to this episode was Ritsu thinking she had an admirer when she receives what she believes to be a love letter, but all it turns out to be was a draft of lyrics Mio left in her mailbox. Also should be noted this episode had the most MALE characters with speaking parts compared to the entire series up till this point. And nope, no jamming what so ever this episode either with the excuse that it was too cold to practice. The Verdict: Would I watch this show again on my own time? Not really. I’d watch it if they aired it on Animax, but I probably wouldn’t be bothered to pick up the DVD to watch this all again. This show has the same fatal flaw Maria+Holic had, which is that the story drifted away from it’s gimmick. Instead of seeing a bunch of cute girls get together to play music, we see a bunch of cute girls get together and goof off, and only play the music because the had too. Sure they already established that they are good, but I would have preferred actually seeing them put the songs together and develop their sound, instead of Ritsu doing a countdown and in the next shot the song it done. ~ by 6six6 on September 7, 2009.